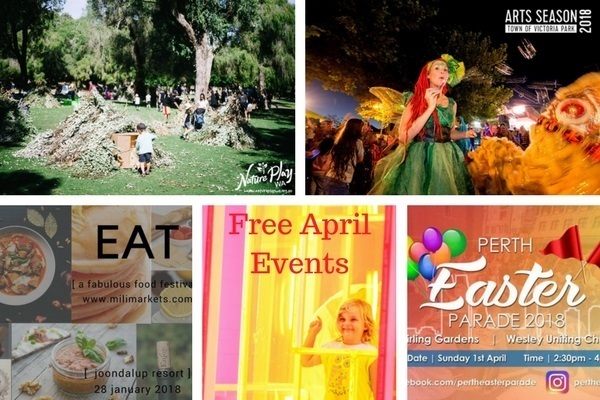 A list of some of the biggest and free events in Perth this April. So big it needs an entire month, the Arts Season sponsored by the Town of Vic Park incorporates a host of free events from workshops and exhibitions, to movies and music. There will be storytelling and sewing, crafts and poetry. Make sure you check out all the free school holiday activities as well. If you need to be reminded that Easter isn't simply about chocolate, join in with the huge Easter Parade for an afternoon of celebration, music, colour, performances and worship. Everyone is welcome. This dazzling new festival will be taking place over three nights, with interactive projections, amazing light projections, live performances, as well as food trucks and a pop-up bar. As the season winds down for the year, the weekly Jazz concerts (every Thursday) will continue to the end of the month. Buy a drink and sausage sizzle, grab a raffle ticket and don't forget your chair or rug. A relaxing evening under the stars. Celebrating the diversity of Subiaco, the Street party returns with a festive lineup of performances and buskers, local and international acts, a kids carnival corner and petting zoo plus so many market and food stalls everyone will find something to excite them. A fun night out. Catch the train. Head to Scarborough for this fun free event with plenty of activities for the kids including games, inflatables, crafts, lucky dips plus food and drink to buy. One of the biggest and best markets of Perth, the Makers Market boasts over 150 stalls, brimming with handmade and locally designed jewellery, crafts, clothing, gifts and homewares. With a strict local-only policy, you can be sure you are supporting Perth's top artisans and creatives. Brought to you by the team behind the MiLi Markets, this new foodie fest by the seaside will have hot and cold food, drinks, bars, produce, kitchen products and more – everything a food lover needs for a lovely Sunday out. Held over two days, this festival will incorporate a range of different events such as traditional ceremonies and rituals as well as cultural displays and exhibits. Kids will enjoy the DIY art and craft and the Chinese Lion and Dragon dancing, while everyone will revel in the fireworks and vegetarian food fair. Are you looking for fun for the kids during the school holidays? Ikea's Kids Academy is back with a range of free activities every Tuesday, Wednesday and Thursday during the holidays. No bookings required. Back by popular demand this amazing event is a unique way for families to interact with nature, with an organised opportunity to build cubbies and forts and mud kitchens as well as try nature arts and crafts and explore the national park with a specially designed interactive scavenger hunt. Free but bookings essential.